Then, they did it again during the apology! The posted comments following the article are outrageously funny! Dems and libs are coming unglued! NBC and Fox News Channel both said Monday that they will stop airing President Donald Trump's campaign advertisement that featured an immigrant convicted of murder. Fox News standing up for CNN? I'm pretty sure there's something about that in Revelations. As Conservative brains short circuit across the nation. ... The call was an unusual one for a journalist. But Luce — who had tweeted on Friday that Trump “has normalized the language of violence in US politics” — was one of a growing number of prominent voices, including former conservatives who oppose Trump, speaking out against Fox News and Fox Business. Earlier last week, the New York Times and NBC News reported that Cesar Sayoc — who is charged in connection to the pipe bomb packages — had a Twitter feed full of “clips from Fox News broadcasts,” while the Pittsburgh shooter was upset by a conspiracy theory, alluded to by Fox News and Fox Business hosts, that Jewish billionaire George Soros was linked to the migrant caravan traveling to the US. Over the weekend, after the mass shooting in Pittsburgh, a guest on Lou Dobbs’s show on Fox Business, Chris Farrell, who heads the conservative activist group Judicial Watch, said the migrant caravan was directed by the “Soros-occupied State Department.” Soros was the first reported target of the attempted pipe bomb attacks, and the episode attracted widespread criticism for spreading anti-Semitic tropes. Washington Post conservative blogger Jennifer Rubin and former senior strategist of late Sen. John McCain’s campaign Steve Schmidt both tweeted harsh criticism of the segment and of Fox News more broadly. “This repulsive and dangerous filth is bring spewed courtesy of a publicly owned corporation,” wrote Bill Kristol, an editor at large at the Weekly Standard. “Will no one on the board, in management, or in a position of influence at Fox speak up?” The episode with Farrell was later pulled, and the vice president for programming at Fox Business Network apologized. 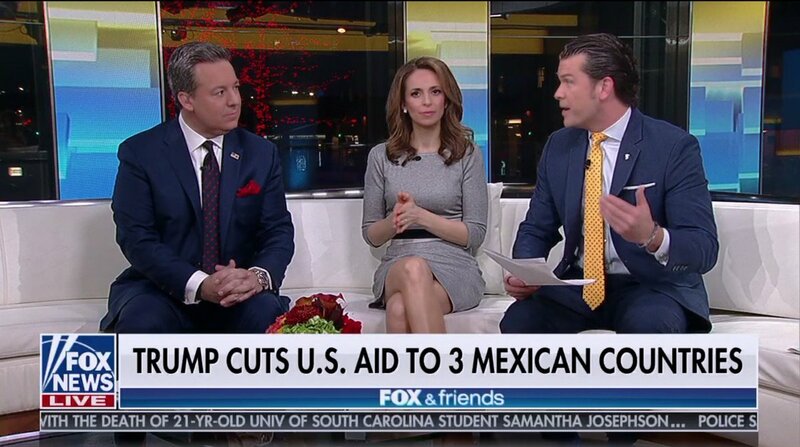 Meanwhile, Monday morning, Fox News was speculating about whether the migrant caravan would bring disease to America. "Stop funding Tucker Carlson's dangerous, racist rhetoric." I work in television. At a station I worked at a couple years ago, one of the executive producers had built a show that was easily accessible to go live in the event that George H W Bush passed away. That show was created in 2014. Point is, media is always ready for when someone of prominence passes. I'm not justifying that the error was ok, but simply pointing out that it isn't uncommon to have something like a fullscreen graphic ready to go in the event of. And to correct Fox News, it wasn't just graphics department error, your TD/Director is also at fault for putting it up, and producer is at fault for having the graphic loaded into the show. Yep, same dumbass who hit a poor (no longer) marching band guy in the back with an ax on live television and trump sucker fashion icon Pete doesn't believe in things that can't be seen by the human eye because he can't see them. Bonus Feature trump considered making Pete head of the VA (pete's a real vet). I am so very grateful I stopped watching fox and more than a little pissed when I bump into one of them like this. Look for trump to step up his game the next two years; it's gonna be something. It's not limited to Faux Noise, unfortunately, but it seems that all "news" has been reduced to reports of "adults" playing the old street game of "yo mama." Just read a story that says Fox News has hired Donna Brazile as a commentator.....strange. And "never worked a job in his life" paul ryan is now on the board of directors. She's good at "playing the old street game of 'yo mama.'" The tweet and photoshops are a hoot. Of course, real reporters and others don't need Kevlar at the border. However, maybe a Faux Noise "journalist", especially one dumb enough to be turned into a fake news prop by CBP does. Heh, I read that story earlier today. The reporter says that the border patrol folks made him wear it....I myself used to wear a bulletproof vest in the shower but lately just wear a tuxedo and just wear the vest to bed at night.